Sporting a realistic putter-shaped crystal replica, PUTTER by CRYSTAL WORLD will be well appreciated by any golfer. Each handsome sculpture features a life-size crystal golf ball, complete with dimples. 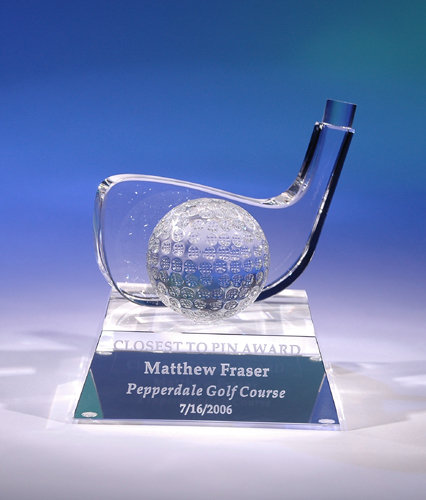 Mounted on a crystal base with a generous area for etching, PUTTER will make a perfect recognition, incentive or achievement award, corporate, executive or retirement gift. Recognition product, corporate gift, crystal award, crystal trophy, golf award, sports award, corporate gift, executive gift, crystal product. 4 3/8' X 4 3/8" X 4 3/4"
Etch area: 3" x 1"